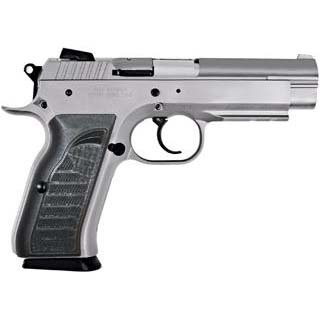 EAA 999102 Witness Full Size Steel 40 S&W 4.5 14+1 Blk Syn Grip Wonder Finish in. The Witness full size steel pistol incorporates several unique design features that have produced a truly outstanding weapons platform. The ergonomic grip allows the pistol to be grasped in such a way that it points more naturally. The slide in frame" design produces a lower profile pistol which places the windage adjustable sights closer to the axis of the pistols bore further enhancing accuracy and the Wonder finish features a polished steel slide."